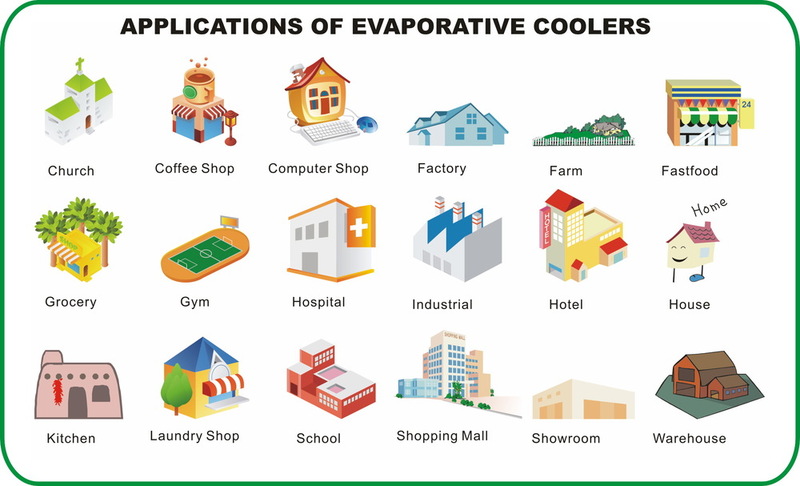 Inter Green evaporative cooling systems are designed to reduce the energy required for delivering cool fresh air to buildings. Our technical development team have designed control systems that will monitor the internal climate conditions and adjust the rate of cool fresh air introduced to the building accordingly.Typical savings for providing air conditioning using evaporative cooling technology can be up to 90%. 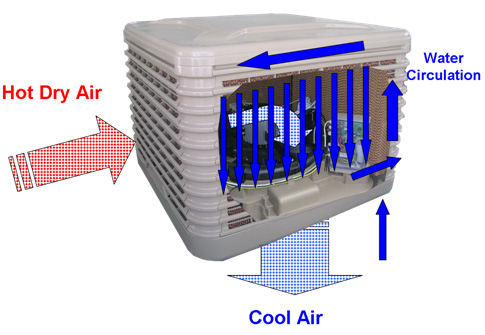 Fresh air is driven through saturated pads (evaporative pads) and the air gives up thermal energy in evaporating the water. This is the same effect that we experience when we have had a shower and begin to feel cold when heat is drawn from our bodies as the water droplets evaporate. Another everyday example of evaporative cooling is the pleasant sea breeze we experience when enjoying a walk along the coastline. Warmer air passing over water gets cooler (as the water evaporates) and we feel the resulting cool breeze. The use of special fans and electronic control enables the InterGreen systems to operate at high levels of efficiency. We are pleased to announce the arrival of our mobile cooling units which are ideal for restaurants and cafes during the summer months. Resource efficiency is becoming increasingly important for us all and energy prices continue to rise above the average rate of inflation. 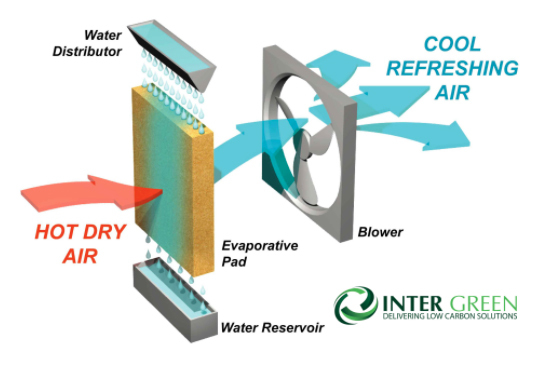 Staff respond better to the cool fresh air that our evaporative cooling systems can deliver. We have a range of mobile/potable systems too and these are ideally suiited for events held in village halls or marquees during the summer months.If you are in any doubt we have completed projects that you could visit and decide first hand.